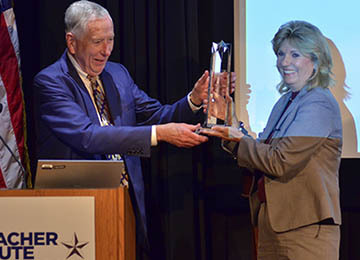 The George Bush Award for Excellence in Public Service recognizes an individual's or group's dedication to public service at the local, state, national or international levels. 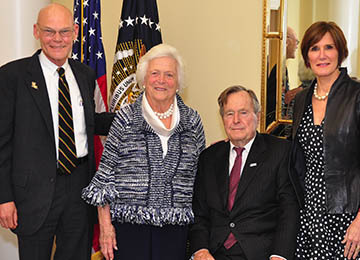 The award underscores President Bush's long service and commitment to public service. In 1997, President Bush confirmed this commitment when he said "Public Service is a noble calling and we need men and women of character to believe that they can make a difference in their communities, in their states and in their country." 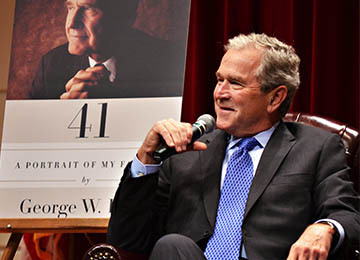 The George Bush Distinguished Authors Series brings preeminent authors whose work is making significant contributions to global policy and current affairs to the George H.W. Bush Presidential Library Center at Texas A&M University. Great leadership requires finding common ground among diverse interests, and being prepared for the pace and complexities of the challenges before us. 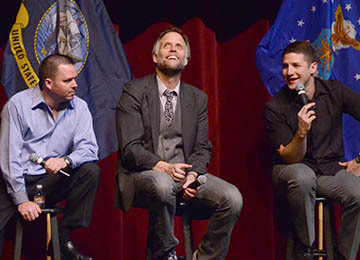 This program helps participants form bonds that bridge the gaps to improve our communities. 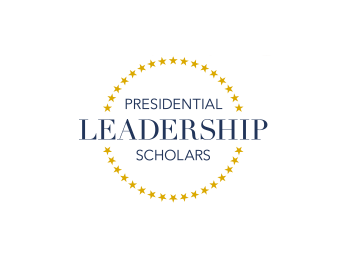 The educational experiences draw upon the remarkable resources of four presidential centers, including the George W. Bush Presidential Center, the Clinton Foundation, the George H.W. Bush Presidential Library Foundation, and the Lyndon Baines Johnson Foundation. The program design allows participants from a variety of sectors to learn from former presidents, key administration officials, respected historians, and leading academics. The sessions are rooted in leadership research and use compelling presidential and business case studies. Bank of America endowed its Program on Volunteerism in an effort to educate individuals and corporations on the importance of volunteer activities in today's modern society. 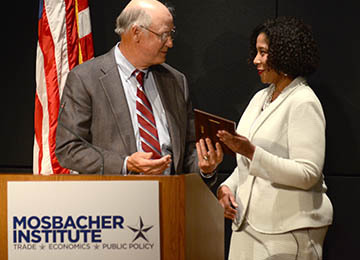 This program is now managed by the Mosbacher Institute for Trade, Economics, and Public Policy. The ConocoPhillips White House Lecture Series brings to public attention the various offices of the White House and Executive Branch that provide policy, administrative, and overall support to the President. 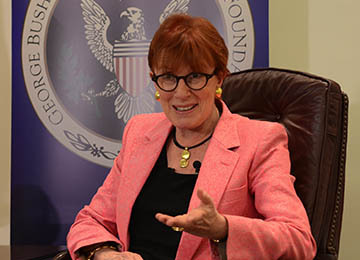 The Kay and Britt Rice Lecture Series is designed to address emerging topics and current events of interest to members of our international, national, state and local communities, and bring prominent experts and central figures in current issues of public interest. In today's interdependent economy, communities must develop leaders who seek regional solutions to common problems and who understand their role in developing a community that can compete in tomorrow's environment. The McLane Leadership in Business Award is designed to instill these qualities and provide an opportunity to learn from successful individuals who have experience dealing with local, national, and global issues. 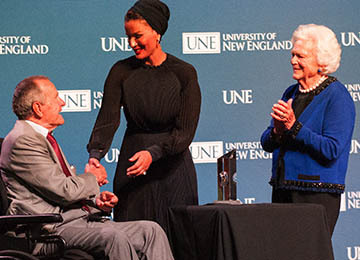 The Lenore and Francis Humphrys International Speakers Program brings to the George H.W. 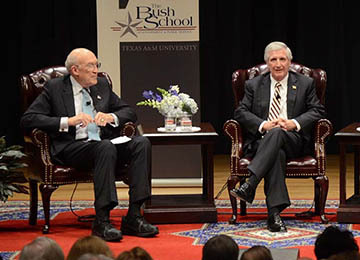 Bush Presidential Library Center and the campus of Texas A&M University world leaders, current and past practitioners, and renowned international affairs scholars. This program is now managed by the Scowcroft Institute of International Affairs. 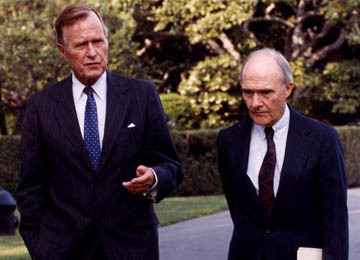 The William Waldo Cameron Forum on Public Affairs brings distinguished leaders and recognized experts on major public affairs issues to the George H.W. Bush Presidential Library Center and the campus of Texas A&M University. 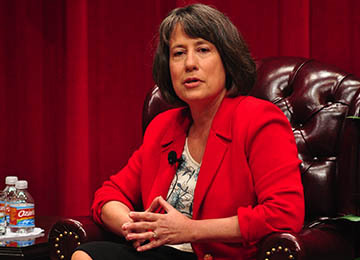 Established through an endowment from Flora Cameron Crichton as a memorial to her father, the forum is designed to reach a broad audience, including students and faculty of Texas A&M University and members of the general public.